Due to a lack of power line capacities plus the generation and load gap between northern and southern Germany, ring flows from Germany via various Eastern European countries to Austria had led to complaints . Accordingly, at the European level and under pressure from the German Federal Network Agency, the separation of the common electricity price zone Germany/Austria was completed on 1st of October 2018. In particular, unlimited electricity trading between the two countries will no longer be possible. However, there is still 4900 MW of transmission capacity, which can be secured by long-term contracts, and depending on the grid situation even additional capacities are added in the spot markets (source: Bundesnetzagentur). A first indicator for the price difference was the auction of the cross-border capacity for October 2018 at the beginning of September. Here, traders were prepared to pay EUR 0.88/MWh for the possibility of transporting electricity from Germany to Austria. However, for the auction of cross-border capacity for November 2018, which took place in mid-October, the price already stood 5.75 EUR/MWh. This is shown by data from the Joint Allocation Office (JAO), the auction office for long-term cross-border capacities in Europe (source: JAO). Almost 55000 MW of transmission capacity were requested, i.e. a good ten times more than offered, while 44 market participants were successful with their bids. The first spot market auctions in October 2018 brought consistently higher prices for Austria and thus also increased the prices for transport capacity for November 2018. Figure 1 shows the daily day-ahead prices on EPEX Spot for the market zones Germany and Austria until 23rd of October 2018. On average, the Austrian spot market price for October 2018 was 9 EUR/MWh higher than the German one. The price difference might only stabilise in the coming months and also depends strongly on the weather conditions in the two countries. 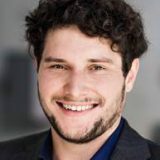 The governing parties in Germany finally agreed on the framework conditions for the special tenders for renewable energies announced back in spring 2018. The 4000 MW for wind are to be put out to tender in stages until 2021. In the year 2019, 1000 MW are planned to be tendered, in 2020 1400 MW and in the year 2021 the agreement mentions 1600 MW. In addition, wind energy projects in southern Germany are to receive 0.3 ct/kWh more support, thus trying to compensate for the north-south gap in wind power installations. An additional 4000 MW is also to be put out to tender for solar energy. However, these quantities will not be counted towards the 52 GW cap. Once the cap´s installed capacity has been reached, PV systems will no longer be financially supported by the EEG (source: Energate). However all of this has not been discussed in the cabinet or written down in a law (Source: PV Magazine). The special tenders were formerly intended to reduce the climate gap by 2020. Due to the long lead times for both wind and PV projects, however, the special tenders will not take effect until the early 2020s. In October 2018, there was also a call for tenders for PV and onshore wind, the results of which were announced by the Federal Network Agency. For both technologies, the average tender values rose by 0.1 ct/kWh. While the solar auction was clearly oversubscribed, the wind tender was undersupplied. Only 54 per cent of the tendered quantity was awarded to developers. The extension of the approval processes led to a shortage of bids according to the wind association BWE (source: Montel). Figure 2 shows the results of the tenders for PV and onshore wind in 2018. It can clearly be seen that the average levy values rose slightly throughout 2018. This trend is more pronounced for wind energy than for solar energy. Each year in mid-October, the amount of the EEG levy for the next calendar year is being announced. Also this year, the TSOs announced on 15 October how high the renewable energy surcharge for the differential financing of renewable energies will be next year. The result: The EEG levy in 2019 will fall by 5.7 percent compared to 2018 and will amount to 6.405 ct/kWh. The main reasons for the decrease in the EEG levy are the almost 40 percent higher electricity prices at the exchang and the high liquidity reserve on the EEG account (source: Tennet). 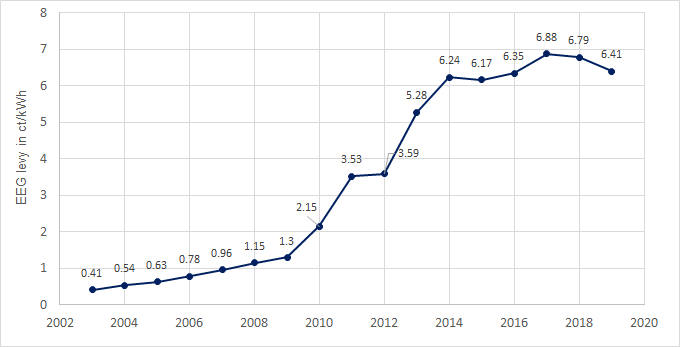 Figure 3 shows the EEG levy for household customers from 2003 to 2019 (data source: Montel). Since 2013, the EEG levy has stabilised at below 7 ct/kWh. This is mainly due to lower feed-in tariffs and higher electricity prices at the market. However, the offshore liability levy, now the offshore grid levy, has increased more than tenfold. 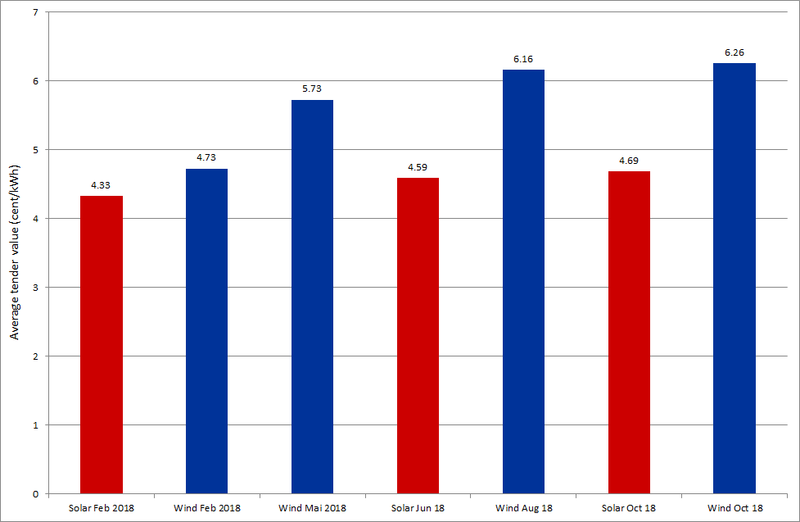 Its value for 2019 stands at 0.416 ct/kWh compared to 0.037 ct/kWh in 2018. In addition to the costs for compensation in the event of disruption and delay of offshore grid connections, the new offshore grid levy now also includes the costs for the connection of offshore wind farms in the North Sea and Baltic Sea (source: Tennet). The lower EEG levy is therefore compensated by a rise in the offshore grid levy. After the peak values for commodities in September 2018, prices oscillated at a high level in October. Prices rose slightly at the beginning of October 2018, then fell again towards the middle of the month and remained stable until the end of the month. The average price for CO2 certificates was around 20 EUR/tonne, at the end of October it fell to 17.5 EUR/t. The price of the future for the baseload delivery of the front year in the German market area averaged at about 52 EUR/MWh and fell to just above 50 EUR/MWh to the end of October. Concerns about a hard Brexit and the uncertainty about the EUAs of the British led to the losses in CO2. The price corrections of CO2 and electricity since September 2018 can be seen in Figure 4 (source: Montel). 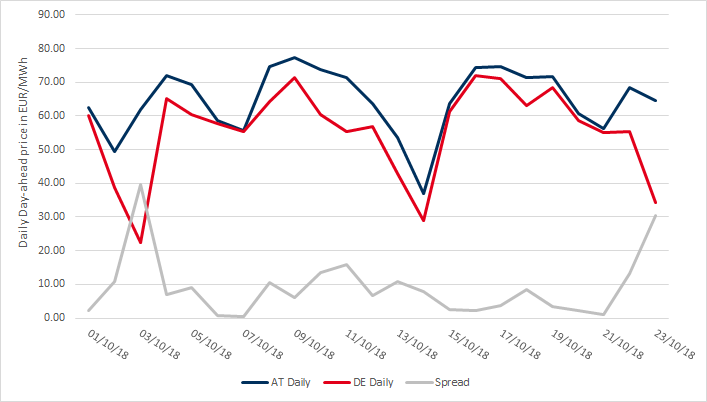 In the spot market, the low wind output led to high daily averages of up to over 70 EUR/MWh baseload and hourly prices of more than 100 EUR/MWh. Figure 5 shows this especially for the Tuesdays 09.10.2018 and 16.10.2018. Also the high generation from hard coal (grey) is quite obvious. The low availability of the Belgian nuclear power units (due to revisions only one reactor unit is currently available in the neighbouring country) drove up prices in the Netherlands and France and via market coupling also in the German market (source: Montel). From the beginning of 2020, a direct link between Germany and Belgium should also be available via the 1000 MW Alegro cross-border power line currently under construction (source: Amprion).